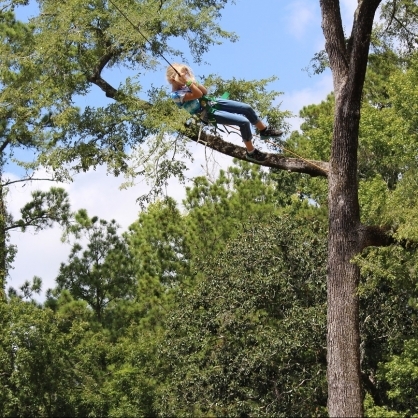 One of the most talked about events of your summer camp and retreat weekend is definitely going to be our Zipline. 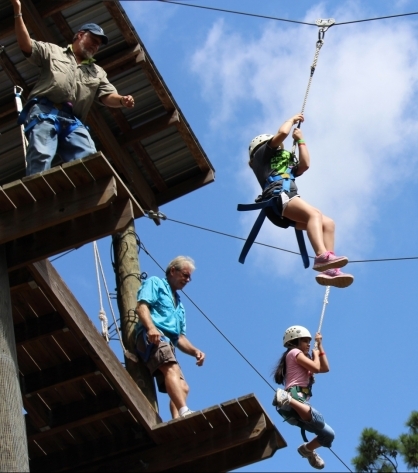 Towering at 40 feet tall and enjoying a 300 foot ride you won't want to miss out on this exhilarating activity at Camp Holy Wild. Gear up with us and climb 3 flights of stairs with your best buddy to take a soaring ride. You are never too young or too old to try this out. Our youngest and most fearless rider was only 2 years old, while our most seasoned citizen was standing at 71 years young. Most people would think that these two went down the Zipline screaming, but instead were laughing the whole way with smiles from ear to ear. Sister to the zipline is our giant swing. You won't want to enjoy one without the other. This thrill attraction gives you more of a drop than a soaring ride. Not only will you be hoisted 50 feet straight up in the air, but it is your friends that are doing the lifting for you. After that first initial drop you can then enjoy taking an easy swing back & forth, or if you're a bigger risk taker you can even try hanging upside down. Here at Camp Holy Wild we pride ourselves on these two high element attractions. The Zipline & Giant Screamer Swing are offered at a small additional cost. Please notify Camp Holy Wild upon registration if your group would like to participate in these elements.